Agility Against Cancer (AAC) was founded by Lotta Bowers after she saw the enormous outpouring of support the agility community gave to Tracey Flower on the 24th July, Pink Sunday. Lotta's aim was to build a long lasting fundraising group that could offer help and support to agility people suffering from cancer. She explains how it works. It is with great sadness that Ryan and I have made the decision to step back and not continue our planned, long term support of Agility Against Cancer. Following the incredible achievements of you amazing people at the KC Festival in August, Ryan and I have been pursuing the information required to get things moving including required documents needed for charity status and access to the AAC bank account. Up until today, we have had neither. With that in mind, Ryan and I feel the working relationship between Lotta and us is not sustainable as the communication had been far from ideal and this would have been to great detriment of AAC. For this reason, we have decided to step away and begin again on our own. This way we will be able to support people more quickly by having control of all the funds from day 1. As far as the funds are concerned, I sent Lotta £5,877.33 last November, to which she has paid me back £5,229.26. This was my share of the £10k + I was holding onto with Ryan holding onto the rest until we had access to the bank account. She is to pay me back the remainder of the money (£648.07) next Monday. This includes cheques made out to AAC from the latter part of last year. The money will be used for the exactly the same cause it was raised for - only Ryan and I will be holding onto this. This money - every single penny of it - will go towards the same causes for which it was originally intended. However, with the help of others, Ryan and I will be setting up a new charity. We urge you to please encourage people who may need some financial support for dog boarding, insurance, support with mobility, fuel costs, almost anything that will keep you being able to do the sport you love, to make an application/ We want to support you. These applications can be made anytime from today. Please drop Ryan or me a message. We should hope now we are working on it from scratch that we will have this charity paperwork sent off by the end of march. if you have any questions at all about our future plans, please just drop me or Ryan a message and we will let you know. There is lots of planning to do, but we will get there. We appreciate you will all want to know about this. It is with great sadness that I have been asked to inform you all that Yvonne has been admitted to Primrose Hospice. Therefore we will not be collecting any further donations for her treatment in Germany. 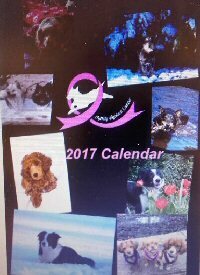 Any amounts collected from now for calendar sales or any other donations anyone would like to make will either go to Primrose Hospice or to a charity of Yvonne's choosing. The family has asked for privacy at this very difficult time. If you would like an update, please feel free to message me, but please do not message Yvonne directly. Please do not tag Yvonne either as she needs rest, and doesn't not need her phone notifications going off. The 2017 Agility Against Cancer Calendar is now available to order. All calendars will be sent 1st class as soon as they have been delivered. £10 per calendar including postage. There is only a limited number of calendars so reserve yours today! Agility Against Cancer is very simple concept. The Dog Agility Community is a great family and families always try to help each other. Seeing all agility people gather together to celebrate the life of Tracey Flower, one of our top agility competitors, and also hearing the sad news about Yvonne Goode gave me the idea to make fundraising easy but also a way to bring our beautiful community together. Most of us have been affected in one way or another by cancer and together we can make a difference. Agility Against Cancer was born and my vision is to create a sustainable fundraising platform to help anyone from our community. All profits will go directly to help fund treatment for agility friends suffering from cancer. The financial strain when you are ill can be very stressful and we aim to lift that burden in any way that we can. Our first mission was to fundraise as much as we could to support Yvonne Goode who needs important immunotherapy treatment in Germany. From donations made directly to the AAC account, £12 802.74 has been donated to support Yvonne’s treatment. During the last few months there have also been individual fundraising going on where the AAC logo and name has been utilised - with our permission - and the funds raised have been directly paid to Yvonne. AAC has had a very successful start and I am overwhelmed with the support the agility community have given in such a short period of time. This now put us in a position where we can apply for charity status which means that we can claim Gift Aid for future donations. Over the last month, I have taken professional advice to ensure we make this application successful . In order to be recognised as a charity, the AAC needed some trustees for I ask for interested people to contact me. The applications were very good and the decision to choose the right candidate took quite a while but, after long consideration, I have appointed Christine Short and Nikki Martin as the new trustees. I wish to say a huge thank you to all applicants as all of you were very suitable. We have had many smaller and larger donations to AAC and I want to reach out to all of you with my thanks. Together we are stronger. We will aim to support you however we can. If you know anyone currently going through a difficult time due to their cancer, please don't hesitate to get in touch to ask for our help! We are happy for any show or company in the agility community to raise much needed funds for our agility friends. If we are available, we are more than happy to attend your show. Wristbands are available for you to sell at a cost of £1 each. We have joined with the rest of the charity world to ask you to pledge your first new £5 note to AAC. Let's do it, let AAC collect them, too. This competition is to raise money for agility competitors who are suffering from cancer so that we can help and support them. Please submit photos of your dog(s) on the theme of the Seasons and send 50p per photo to the Agility Against Cancer PayPal account agilityagainstcancer@gmail.com Then 'like' your favorite photo(s) and the one with the most likes will win a set of bespoke mugs with your dog on it. The 12 most 'liked' photos will be featured in our Calendar. Details of how to purchase the finished calendar will be published later. Lotta Bowers is celebrating her 40th birthday with a Beer Festival at the Lyme Stone Brewery on 3rd December. 7pm to midnight. Dog Vegas will be running a new charity show, in aid of the Agility Against Cancer. The date for your diary is 8th January 2017 and the venue Oakridge Arena, Collingham. The schedule is available on Agilitynet or online at First Place Processing. All proceeds will be donated to the charity.